Location! 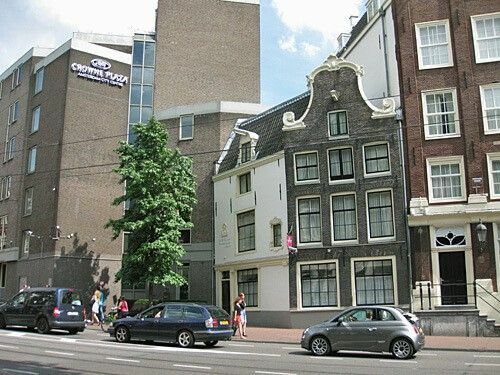 Four-star Crowne Plaza is right in the heart of Amsterdam; close to Central Station, Dam Square and the Canal Belt. One pleasure is the sumptuous breakfast in the morning another is tasting liqueurs with imaginative names like My Aunt’s Water late evening. Add to this a kingsize bed with soft pilows; getting up in the morning has never been so difficult. Located in a modern building, the 270-room Crowne Plaza harmonizes with the neighbouring historic buildings. The hotel restaurant and Bar, New Dorrius, is housed in an old canal-style house and fully incorporated in the structure. The Nieuwezijds Voorburgwal is no longer one of Amsterdam’s canals. In the middle of the nineteenth century, the canal was filled in to cope with the ever-increasing traffic. The rooms of Crowne Plaza Amsterdam City Center are spacious and well-equipped, exactly what you would expect of a four-star hotel. The full breakfast buffet is a pleasure for the eye and the taste buds, but not always included in the room rate. Crowne Plaza is one of the few hotels in Amsterdam that has its in-house swimming pool. Try Dutch dishes in The Dorrius restaurant. This is your opportunity to eat pea soup or oysters from the province of Zeeland. Savour liqueurs with exotic names such as Amsterdam Elixer, Gulden Water (Gold Water), Naveltje Bloot (Naked Navel) or Eau de ma Tante (My Aunt’s Water).